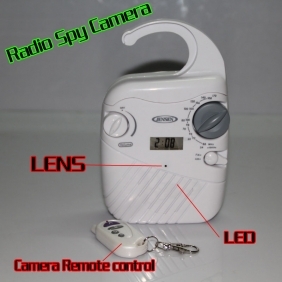 This is a ultra-small digital spy camera that hidden inside a Waterproof Radio, it looks like an ordinary Waterproof Radio, but it has a very powerful function, the most interesting thing is that it internally hides a smallest camera DVR , you can listen to the radio and record everything you need at the same ,so secret that no one know where the camera exist.it does not need any external plug-in card, built in memory 32 GB itself, can work up to 8-10 hours. there is time date stamp for the record, you can get the most authentic evidence for a variety of illegal behavior.ideal for CIA agents ,police,detector,and spy agency. 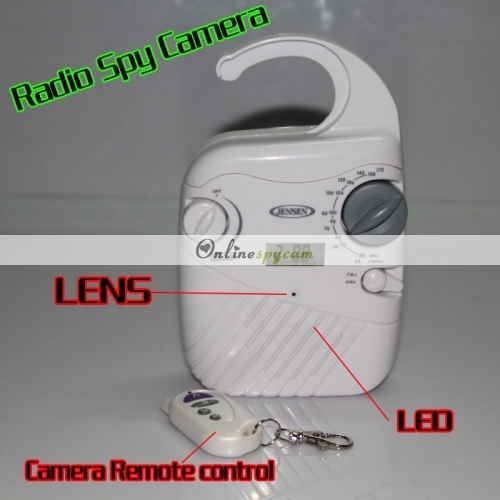 The Waterproof Radio unexpected is still made you easy to use as a professional detective waterproof pinhole camera, hidden camera installation, there is an external remote control camera, the camera operation fast and convenient, easy to record your everything you want.